Santa Cruz harbor restaurant The Crow’s Nest has some great Monday through Thursday specials, valid at both lunch and dinner, and they’re ending this Thursday, March 9, 2017 — although the “Deal With a View” dinner special, served only in the upstairs bar, is also wonderful and that one’s valid through May 25. Monday is retro menu ($21.95) with your choice of tempura scallops, broiled salmon or enchilada and sirloin. Each entrée comes with soup or house salad plus rice and vegetables. Tuesday is lobster ($21.95) — broiled lobster tail with soup or house salad plus rice and vegetables. Wednesday is steak day ($21.95): choose prime grade large top sirloin with crispy fried onions and Chef’s steak sauce or petit filet mignon with mocha rub and porcini butter or smoked 10 oz. prime rib (while they last). All come with soup or house salad, mashed potatoes and vegetables. Thursday is prix fixe menu ($25), where customers receive a three-course menu designed by the chef. 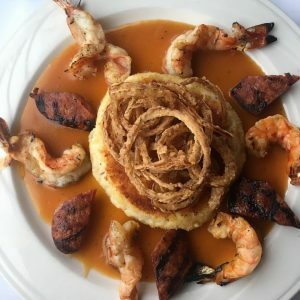 Two recent entrées are pork tenderloin in a syrah demi-glacé, topped with house smoked blue cheese and accompanied by pumpkin gnocchi with candied bacon; and “Drunken Prawns” with prawns, Andouille sausage, potato Parmesan pancake and crispy onions in a bourbon gravy. As I mentioned, there are four days remaining this season to get the above weekday specials; they might be back again after Labor Day. Deal with a View, on the other hand, is still running after this week. It’s only available upstairs, in the Crow’s Nest Breakwater Bar & Grill. It’s served from Monday through Friday evenings from 6 p.m. until the kitchen closes. For $9.95, customers receive entrée choice of Tuscan Chicken Sandwich, Fish Tacos, or Aloha Burger, served with soup, salad or fries (salad bar option costs an extra $2). Another option: I just bought food from the restaurant’s next-door shop, Beach Market, for the first time. I highly recommend it. They have lots of very reasonably priced wood-fired pizzas plus sandwiches, salads and more. I enjoyed chicken pesto pizza and my young daughter liked the Hawaiian variety. My husband loved his pizza sandwich (mozzarella and red sauce with choice of three toppings on a francese roll). For details on all of these, visit the Crow’s Nest web site.